We’re blessed to call this beautiful part of Maine home. People care here, and they go above and beyond to make sure our care teams’ have the resources they need to care for local kids. 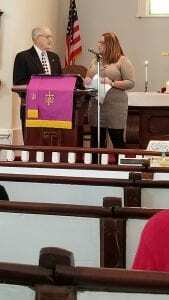 On Sunday morning, the member of the First United Methodist Church of Orrington presented program director, Kelly Pearson, with a check for $1,000 in memory of Daniel Powell. Dan was an inspiring young man whose contagious laugh and spirit won’t soon be forgotten. He shared his story with the church last August, and they took it on as a mission to give back in his memory. Previous post: Is it RSV or is it the flu?